2019 Jennifer Kryger Spirit Award Winner — Novice Player, Brynn! Each Junior Team’s Coach nominates one player for the Jennifer Kryger Spirit Award at the Grand Rapids Tournament. Sled hockey players who display similar character qualities on and off the ice as Jennifer, a previous Sled Wing’s player, did in her short life. Jennifer was encouraging to her teammates and befriended others. She had a positive outlook on life, and a contagious laughter that brought smiles to many. Jennifer put a lot of heart in her game and as a sled hockey player, never gave up. Our coaches nominated our newest player, Brynn, attending her first tournament. She was diagnosed in May with Hereditary Spastic Paraparesis a progressive degenerative spinal cord disorder. This year’s winner is Brynn!! 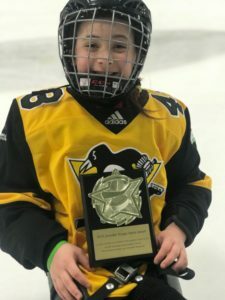 Brynn is new to the Mighty Penguins, she has instantly became a part of our team with her determination, eagerness to learn the sport, and genuine happiness. Prior to playing sled hockey, Brynn was an avid softball player, playing on a travel team. Bryn has Hereditary Spastic Paraparesis a progressive degenerative spinal cord disorder, which she was officially diagnosed with this past May. Her symptoms quickly came to a point that she could no longer play Travel Softball or run and play with her friends without falling. Brynn loved being part of a team and the competition of sports, she didn’t know how she would fill that part of her life and then she was introduced to sled hockey by her doctor. The moment he showed her the video of sled hockey, Brynn knew she found her new sport. Since Brynn first got into a sled, she has been committed to the sport, creating new friendships with her teammates and honing her skills. She has joined us in every practice, our strength training program, and 2 sled hockey day camps all in less than 2 months of playing sled hockey. She is looking forward to her first tournament in Grand Rapids. Brynn always has a smile on her face, approaches everything positively and brings joy to those around her. Brynn’s mom says that even though Brynn’s life has changed a lot in a very short period of time, she has always stayed positive. Brynn’s always had a bright smile and her mom was afraid she would lose it through all of this but she hasn’t. Brynn is very deserving of this reward, she processes many of the same characteristics of Jennifer Kryger and brings positivity to those around her. Congratulations on the well deserved award celebrating your amazing spirit!